In a chilled bowl, whip the cream with the vanilla until soft peaks form. Keep in the refrigerator. In another bowl, whip the peanut butter and cream cheese until achieving a very creamy consistency. Stir in sugar, whip until dissolved and mixed well with whipped cream. In dessert glasses alternating layers of mousse and graham crackers. Refrigerate for an hour. Truffle: Boil the cream in a saucepan. Turn off the heat and add all the chopped chocolate. Let stand about 3 minutes and then, using a spatula, stir from the center, until the chocolate is completely melted and looks smooth and shiny. Add butter and stir carefully. Remove the dessert from refrigerator and top each one with a spoonful of truffle-or enough to completely cover the surface of the mousse. Refrigerate truffles until firm, about 45 minutes and serve. Peanut butter mixes well with chocolate. You can add chopped and glazed peanuts as decoration. You can make the truffle with milk chocolate or white chocolate, whatever you like. You can use mint leaves as garnish. One of my favorite ingredients has always been peanut butter. It’s incredibly delicious and can be used in savory or sweet dishes, from simple peanut butter on toast to many other more complicated recipes. Whenever I taste this ingredient, I am immediately transported to my childhood and I am reminded of my paternal grandfather who would always bring me jars of peanut butter because he knew how much I loved it. I would always devour them with either bread and guava jelly, or crackers; sometimes I’d add a spoonful to my milk or mix it with chocolate. It was magical… and delicious! This recipe started out as a pie, but has evolved over time into this creamy and delicate pastry. Believe it or not, peanut butter actually has a very subtle taste that isn’t too invasive, making this dessert perfect for any occasion. You can make it ahead of time and keep it refrigerated. 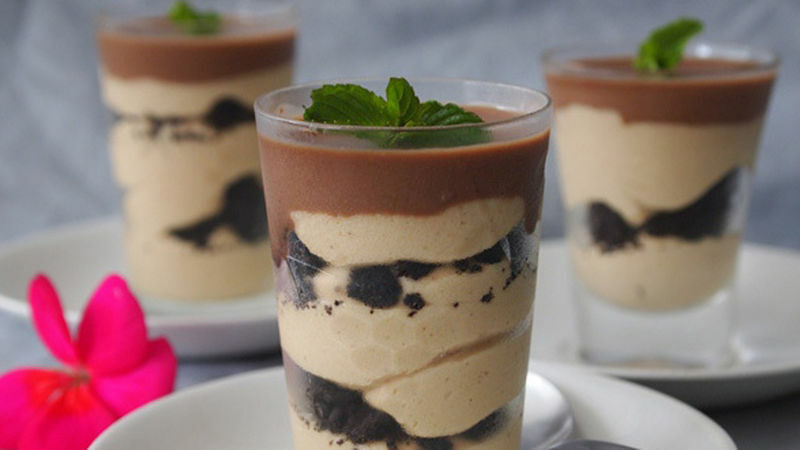 Leave it at room temperature for 15 minutes so it’s not frozen when you serve it and the creamy texture of the mousse can be enjoyed. I’m sure you’ll enjoy this dessert as much as I do!